Because a standard gaming mouse from Razer is just too mainstream in terms of looks, which is why Thermaltake has commissioned DesignworksUSA to come up with this particular conceptual design for an innovative gaming mouse that seems to hail from the distant future, despite being ever ready to be cradled by a curved palm, wreaking havoc on your opponents with razor sharp precision and smoothness you will not believe until you give it a go. This partnership between BMW Group subsidiary DesignworksUSA and Thermaltake is certainly 10 levels up from the ordinary (which could be one of the reasons for its unique name), and we are pleased to hear that the Level 10 M Mouse will actually hit the gaming market sometime this spring – although pricing details have yet to be confirmed, I am quite sure it is not going to be cheap at all, considering the amount of investment poured in for such a future forward design. Definitely high end stuff that might break your monthly gaming budget. The Level 10 M Mouse will sit down prettily beside the Level 10 GT computer case, as that is the main source of its design inspiration. Touted to be ergonomic, it is really a sight to behold, just make sure your gaming skills are up to par so that you will not end up as the equivalent of a snotty nosed kid who just got his driver’s license and is taking dad’s Ferrari out for a spin for the first time. 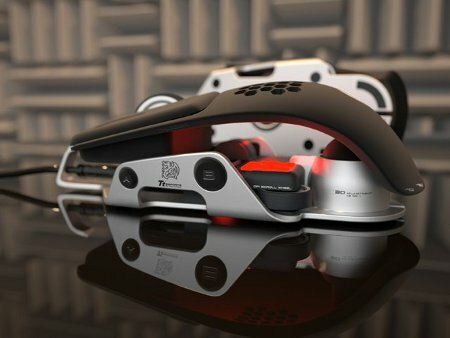 Sporting a hollowed out body, the Level 10 M Mouse can have its height adjusted alongside its angles, where all you need to do is turn a screw on the top side of the mouse to kick start the adjustment process until your palm and fingers settle on a sweet spot. Not only that, the perforated palm surface ensures there is a passive airflow to help players born with naturally sweaty palms stay dry. Wow! its in a great shape mouse i like mouses in diff shapes much….